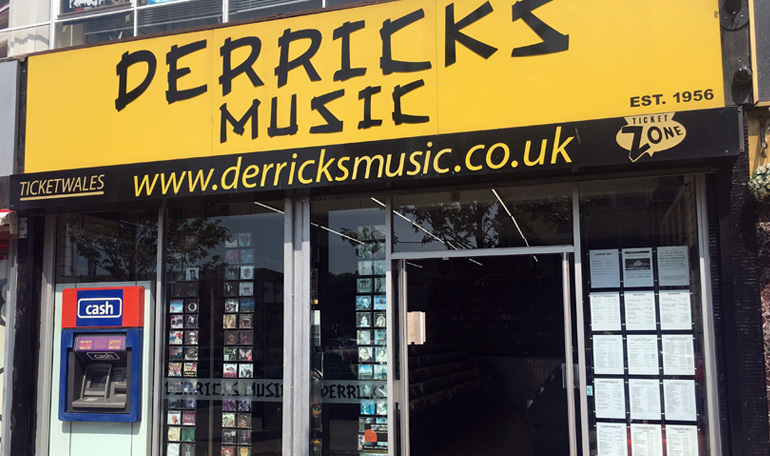 Derricks Music was started in Port Talbot by Derrick, the uncle of current owner Chris Stylinaou, as an electrical store that stocked a few LPs. Like other shops in the 1950s and 1960s, they found that selling records was more lucrative than selling electrical goods, so the family opened a second shop in Port Talbot selling only records, which was said to be the first record shop dedicated to pop and rock music in Wales. In 1968, Port Talbot was being re-developed and one of the Derricks shops was due to be demolished, prompting the family to move their record retailing business to Swansea. Like many stores which have survived the recent downturn, a fundamental reason why they are still standing is that Chris owns the building which they trade from. One of his shrewdest moves was to rent out space for a cash machine, which is neatly embedded in Derricks front window, making it super-convenient for customers who have just acquired a bunch of crisp new notes to spend some of them in the shop. Derricks is also kept in business thanks to sales of concert tickets and the success of Swansea Live, an event organised by Chris which takes place in the city centre every August. With more than 20 bands playing across three stages, it attracts large crowds to the city and gives up-and-coming local bands the chance to play to a large audience. 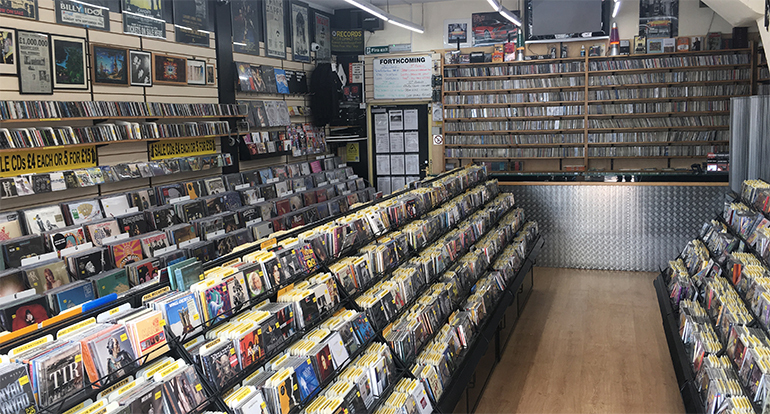 This is what record shops do: they support the local music community. Chris inherited the record shop after Derrick passed away in 1985. He has been ably assisted over the years by his longtime assistant Sian. It is worth a visit to Derricks to hear the banter between the two of them, even if you have no plans to make a purchase. Chris has several claims to fame including being Welsh Junior Surf Champion. He can often be seen surfing the waves off the Gower Peninsula. Many years ago, Elizabeth Taylor cooked him chips one evening when he visited his friends Alan and Richard, the sons of the late Graham Jenkins who was Richard Burton’s brother. Richard and Elizabeth were visiting, and the Oscar-winning actress cooked the evening meal. One claim to fame Chris wishes he did not have is that of being the unluckiest record shop owner in the world. His run of bad luck started in 1998 when he was the victim of a violent robbery. At 8.00am he was preparing the shop for opening when he heard a knock on the back door. When he opened the door Chris was confronted by two men brandishing a gun. They attacked Chris, tied him up and then cleared out what money he had in the till. They then dragged him up the stairs which resulted in a serious wound to his leg as a metal strip ripped open his shin. The burglars threatened to shoot Chris unless he revealed the code to access the safe. After emptying the safe they locked him in the cupboard. With blood pouring from his wound Chris knew that he needed to get to a hospital soon. The cupboard he was locked in was where he kept his tools. He managed pick up his saw and cut through his ties. He then used his hammer to smash his way out of the cupboard and called the police. After visiting the hospital, Chris spent the next day being questioned by the police about the break in. His leg-wound took a long time to heal leaving him with a large scar that reminds him of the awful experience. Sian demonstrated her supreme sales skills, even under such troubling circumstances. While the shop was shut that day, she sold CDs to the police investigating the crime, some of whom still come in to the shop to this day. More bad luck occurred not long after. During a heavy storm the drains blocked, and the shop was flooded. The floor was ruined along with the vinyl kept in boxes under the racking. On another occasion, when scaffolding had been erected to enable repairs to the building, another gang of burglars gained access to the shop by climbing up and smashing the upstairs window. Disaster struck again when Chris became violently ill after eating a meal of prawns. He was sick for weeks and lost all the hair on his body except for a small patch on the back of his head which turned from black to white. He had suffered mercury poisoning and is still being treated for the effects of it to this day. Things could hardly get any worse. Or could they? In 2014 Chris’s neighbours started building an extension on their house. When their builders dug into the ground it caused the foundations of Chris’s house to drop, making the whole structure unstable. Huge cracks appeared in the walls and ceilings. The council, fearing that the house could collapse at any point, ordered Chris and his family to leave immediately. For the last few years, they have lived in temporary accommodation while builders are trying to secure his house. He is beginning to wish they had knocked it down and he could start again. In January 2018, I wrote to Chris to ask if he minded me referring to him as “the unluckiest record shop owner in the world.” I did not hear back for a week. He finally called to apologise for the delay in replying. He had been laid up in hospital, following a heart attack. A week later there was an earthquake in the UK. The epicenter was in Swansea. My immediate thought was that it was bound to have struck underneath Derricks. Thankfully, the shop had been left unscathed – by the earthquake, at least. However, the builders had left a tap running over the weekend and the house had flooded. And his wife Vicky had just written off her car in a crash. This hard-working man deserves some good fortune. Fingers crossed for the future, Chris. 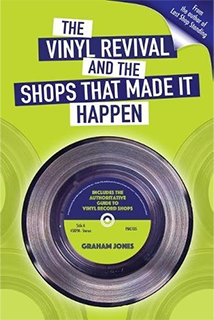 Features on over 200 more independent record shops in the forthcoming book ‘The Vinyl Revival and The Shops That Made it Happen’ by Graham Jones. This entry was posted in Featured Store and tagged derricks music, The Vinyl Revival And The Shops That Made It Happen.